The United States’ tradition for expensive warfare continues. According to a report published by the Mercatus Center at George Mason University on January 21, funding commitments for the global “war on terror” have cost the United States about $1.7 trillion since September 11, 2001. The examination of federal defense spending cites a report filed by the Congressional Research Service, which shows that the U.S. government spent $1.6 trillion up to FY 2014 on Iraq, Afghanistan, and other military operations overseas. 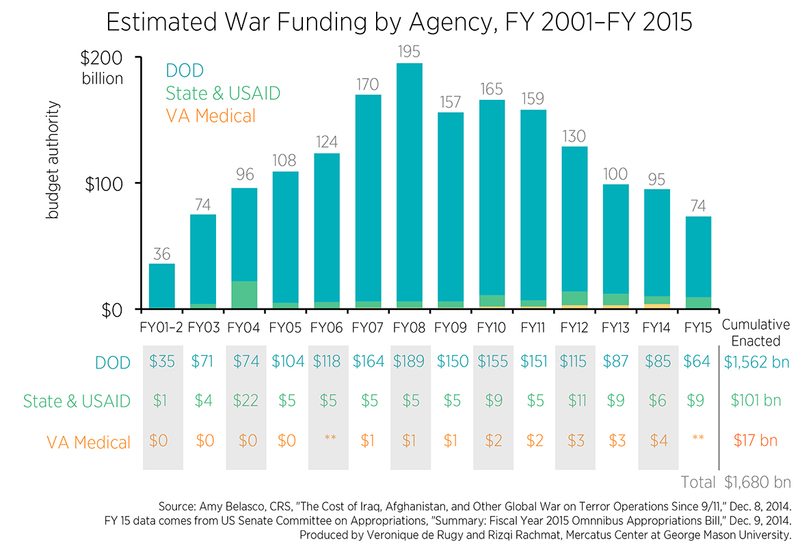 The war funding approved by Congress for FY 2015 bumps the total up to $1.7 trillion. As the United States engages new threats in the Middle East, like the Islamic State, President Obama has asked Congress to increase the total defense budget by $38 billion — pushing total annual defense spending to $534 billion. However, these numbers may change slightly when the proposed budget comes out on Monday. The “war on terror” is one of the most expensive war efforts in the history of the United States. The Iraq War, on its own, cost $694 billion. To put this amount in context, the Vietnam War (minus benefit claims from veterans) cost the defense department between $140 billion and $173 billion. When adjusted for inflation, Vietnam cost about $686 billion. However, America’s efforts in the Middle East are still dwarfed by the size and scope of World War II, which cost approximately $4 trillion when adjusted for inflation. Reigning in war spending has been a difficult task for the government, despite current measures in place like sequestration cuts. However, Veronique de Rugy, a senior research fellow at George Mason University and the study’s author, says voters are often not given the whole story when federal officials discuss war funding. The Mercatus Center at George Mason University reports that the costs of Wars in Iraq and Afghanistan are now pegged at $1.7 Trillion, including projected data from the 2015 fiscal year. Chart by Veronique de Rugy, of the Mercatus Center. She further explains that lawmakers utilize certain tricks to evade the Budget Control Act of 2011, which sets caps on spending and calls for a balanced budget. According to de Rugy, Overseas Contingency Operations (OCOs) are frequently used to make missions exempt from the spending caps. “Policymakers have been rightly criticized for evading the caps by designating funds as OCO that should arguably be in the Pentagon’s base budget,” she writes. Now, the Republican-controlled Congress reportedly wants to lift these spending caps for defense and take a harder look at domestic spending cuts. Domestic spending — including Medicaid and Social Security — accounts for a hefty part of the 2015 budget. In 2013, Medicaid and Social Security each accounted for almost a quarter of the government’s spending, according to the Center on Budget and Policy Priorities. The mandatory entitlements will also increase in the 2015 budget, but only marginally. For example, $857 billion was spent on Social Security in 2014, and the projected 2015 cost will fall somewhere between $892 and $903 billion. The lingering issue is not only whether or not Congress and the White House can agree on a budget, but what this agreement will look like. When weighing war funding with domestic spending, policymakers need to reflect on what exactly we are spending money on and if it is worth the price taxpayers are paying for it. When discussion federal spending, what should be the biggest priority for lawmakers? Based in Toronto, I am an award-nominated multimedia journalist with an interest in cities, sports, culture and current events. I produce and edit content for online and print publications, shoot photography projects, and put together video projects from time to time.